We Can’t Believe It’s Been 6 Years Already! The year was 2013 and I was on vacation for the holidays. Larissa and I, a steak-loving couple, decide to watch Netflix and queued up a couple of documentaries just to pass some time. For some reason, we decided on “Fat Sick and Nearly Dead” and “Vegucated“. By the end of Vegucated, Larissa and I decided that we were done eating meat. How hard can it be, right? Just don’t eat meat! While our hearts were certainly in a good place when we decided to become vegetarian, our brains really had no idea what we were doing. We feasted on Oreos and Fritos and other highly processed junk food thinking that we were doing just fine. However, it only took a few days before our bodies told us otherwise. At first, I thought, “Well, I guess I just need to eat meat” but I knew I couldn’t go back after seeing those documentaries. So what’s an aspiring vegetarian to do? Rather than give up on vegetarianism, we decided to look for some online resources to help us understand what to eat to ensure we were getting the proper nutrition. Almost immediately after implementing some of the guidance we found we started to feel better! As we learned more, we felt the calling to share this with friends and family. Not in a “preachy” or “judgmental” way but rather just as education. In July of 2013, we decided to share what we were learning on our plant-based journey with you, dear community. Bring us your vegan, your vegetarian, your veg-curious! No judgments or shaming here…just good food, good friends, and good fun! So with 291 episodes already under our faux leather belts, we’re proud to bring you the 6 things we’ve learned in 6 years of being vegetarian. Finding a supportive community where you feel comfortable asking questions is essential! While researching plant-based nutrition we came across a TON of great resources. Unfortunately, we also came across some groups and sites that were less focused on educating people and more interested in scolding them for not doing enough. Discovering that these sites and groups existed was the push we needed to create Vegetarian Zen. As our community has grown over the years, we’ve attracted folks with our same tolerant vibe. When you first transition to a plant-based lifestyle figuring out what to eat can be a challenge. Your best bet is to start with what you currently like and see if you can make that plant-based. It’s really a lot easier than you think. Simply googling “vegan pizza” will result in lots of recipes for you to choose from. Once you master a few of your favorites, you might even build enough confidence to try out some new recipes you find…or create your own! Deciding to become vegetarian, vegan, or simply more plant-based isn’t an “all-or-nothing” deal. If you “slip up” and eat meat again is no reason to throw the baby out with the bath water. All-or-nothing thinking often leads to giving up altogether, and we definitely don’t want that. Forgive yourself if you stray from your goals. If your goal is simply to eat less meat or dairy, then the fact that you are even more aware of what you are eating is a win in our book! When we first became vegetarian, we thought replacing meat with faux meat was all it took. When we didn’t like the taste or texture at first, we thought it might just take some time to adjust. After a while we realized that there are some faux meats we like and others we just don’t…and that’s OK! You can always try making your favorite meat-based dish minus the meat. We also learned that the hearty texture of some plant-based foods such as jackfruit and portobello mushrooms make excellent stand-ins for meat in some dishes. How embarrassing is it to gain weight when you become a vegan or vegetarian? When we became vegan/vegetarian we ate a lot of junk and guess what…we gained weight! Even today it’s easy to forget that some plant-based food is actually not that good for you. We recently started Weight Watchers again (we’ve had success with it in the past) and are finding that it’s really not difficult to follow on a plant-based diet and it really does help us focus on eating healthier foods. There is so much good food out there but it’s easy to get stuck in a rut, particularly when you go plant-based. In fairness, neither Larissa nor I was very creative with cooking even when we ate meat, and nothing much has changed in that regard. To shake things up, I recently took the Forks Over Knives cooking course, which taught me more about the basics of cooking so that I would be braver about trying new things in the kitchen. Check out my review of the FOK cooking course here. If you don’t have the time or money to take a course, find a recipe featuring a vegetable or fruit that you don’t cook with often, or switch up your juices or smoothies by using different ingredients than you’re used to. Simple actions like these can help break you out of a rut. And there you have it! 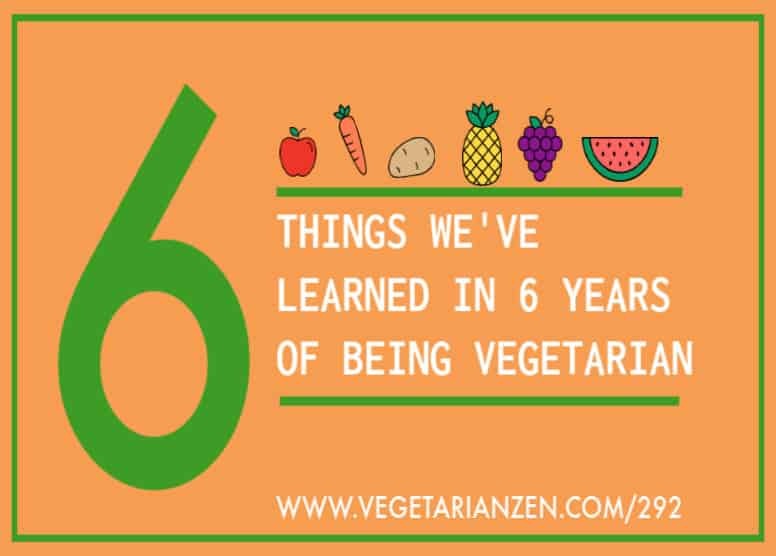 Our top 6 biggest learnings in the 6 years we’ve been vegetarians! And now, we’d love to know…. What are the big lessons you have learned on your plant-based journey?